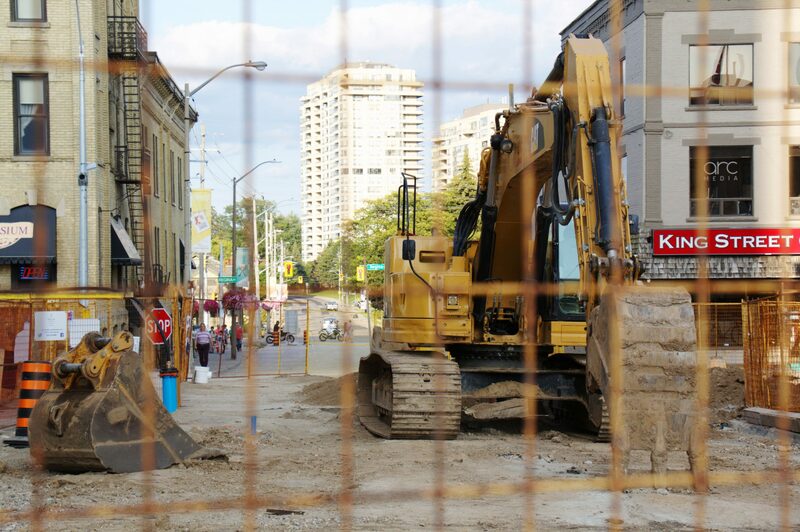 The King Street and Erb Street intersection is now undergoing construction by the City of Waterloo to create a more accessible intersection for all modes of transportation. Upon reopening in early October, the intersection at King Street and Erb Street will introduce a protected intersection with wider sidewalks and new off-road cycle tracks, including crosswalks for bikers. This protected intersection will be the first of its kind in the region. In addition to the sidewalk enhancement, King Street will be reduced to two through lanes and two left turn lanes. Erb Street will remain the same with three lanes for traffic. By reducing the travel lanes on King, the city has been able to add extensions to the sidewalks. “With these cycle tracks we are now providing an opportunity to include protected intersections which offset the crossing locations for cyclists, making them more visible to motorists and provides a greater reaction time for motorists,” said Eric Saunderson, senior project manager at the City of Waterloo. One of the intentions for introducing protected intersections is to encourage more of the population to cycle. Saunderson stated that studies by the City of Waterloo have shown that 60 per cent of the population would be more likely to cycle if they felt more comfortable. By making these adjustments to the road and sidewalks, the city is able to create enhanced separation between cyclists and motorists with the intent to make bikers feel more comfortable and safe. The enhancement of this intersection is just one of the many improvement projects planned by the City of Waterloo. Plans to continue the off-road cycle tracks on King Street between Ion Station and University Avenue have been under review. “We want to create consistency for both motorists, cyclists and pedestrians as they approach these intersections. That’s important so people know what to expect and know how to navigate accordingly,” Saunderson said. The city has designed the area under construction to address its high collision rate by reducing the number of lanes and making it an overall more inviting and safe environment. Prior to construction, public consultations were held where the City of Waterloo received valuable feedback from both residents and students, feedback which has been built into the designs. “The focus has been on construction and completing the work but I think that when people start to see the final project coming together they will get a new perspective of what it’s going to look like,” Saunderson said. The intersection at King Street and Erb Street is not the only intersection on King to receive streetscape improvement. “We want to make it more attractive for users of the street, we want to make it unique and a place for people to go and enjoy,” Saunderson said. Many more initiatives have also been proposed to improve the streetscape of many intersections along King Street, such as introducing new decorative thematic tree lighting along King Street. The new lighting will illuminate the trees to correspond to special events, holidays or themes happening in the area. Initiatives such as this are a part of the city’s overall plan to improve the roads, some of which are over 100-years-old.